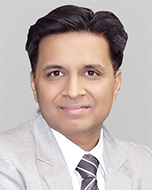 Vikas Garg is the Managing Director of Vikas Ecotech Limited. He is responsible for charting the strategic direction of the company as a science-driven entity focussing on the “art” of chemistry. Under his leadership, the company has made continued investments in R&D and IPR-led technology. This has helped it become a niche global player manufacturing environment-friendly IPR-owned specialty chemicals. Vikas has over two decades of hands-on experience. Having started with trading and moving on to manufacturing specialty chemicals, he is committed to driving the business towards a greener tomorrow. He has built one of the finest teams of scientists, engineers and business managers that is co-driving the company’s domestic and international growth. Since joining the board in 1992-93, he has developed international clients and built a dominant domestic market share. With backward integration and cost & quality leadership, the company has delivered consistent growth and profitability. He holds a Bachelor of Commerce degree from the prestigious Delhi University. As a Promoter-Director, he is committed to employee growth and doing business in a responsible and fair manner. With a professional leadership team managing the day-to-day functioning, Vikas spends significant time travelling. He scouts new technologies from across the globe, spends time in the company’s R&D labs for new product development and meeting global customers. A fitness freak, today, Vikas is a global citizen who works and lives out of New Delhi, the capital of India. He devotes time to various social causes and believes in giving back to society through active volunteerism.